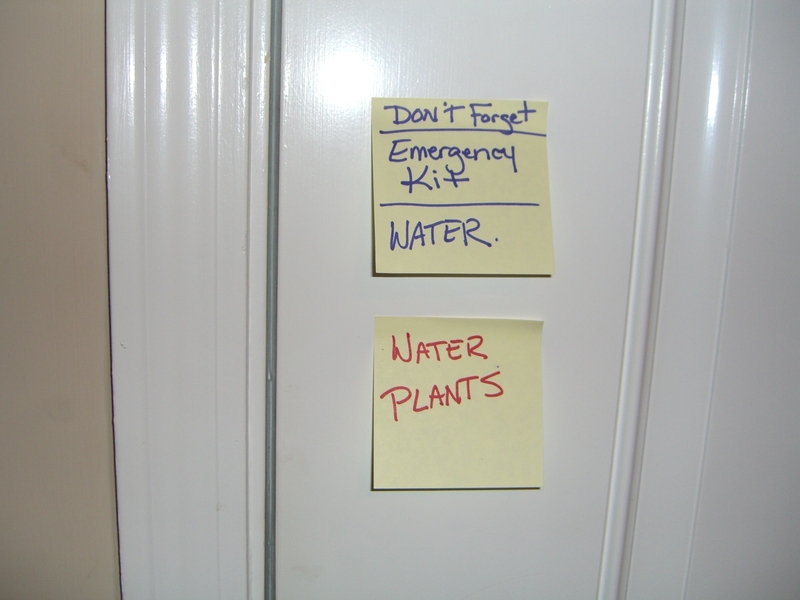 Instead of creating a reminder on list on-line, I posted notes through-out my house. Things we need to remember. How many times have I forgotten to take my medication? Too many! Now I keep them all sorted by day and time to take, and have them where I won't miss them. 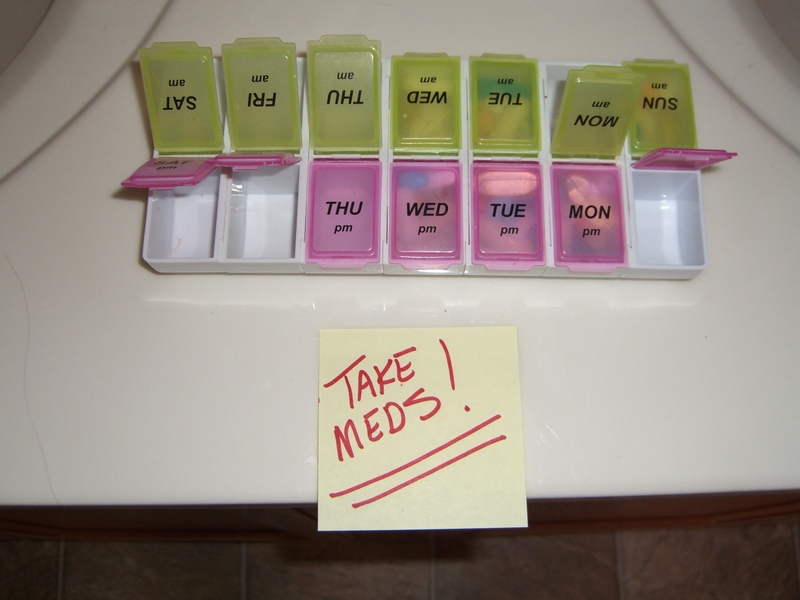 Must remember to take my meds! 2 Things I have to remember before I can take a shower. 1 - Take my hearing aid out. Yes I have gotten in the shower and started to wet my hair and realized...Oh NO! I have my hearing aid in! Luckily no damage done, but this I must remember! 2. Because of the vertigo and disequilibrium, I cannot take a shower without someone near to hear me if I need help. I've fallen a few times, or ended up sitting on the shower floor just trembling in fear. I need to swallow my pride and ask my husband for help. 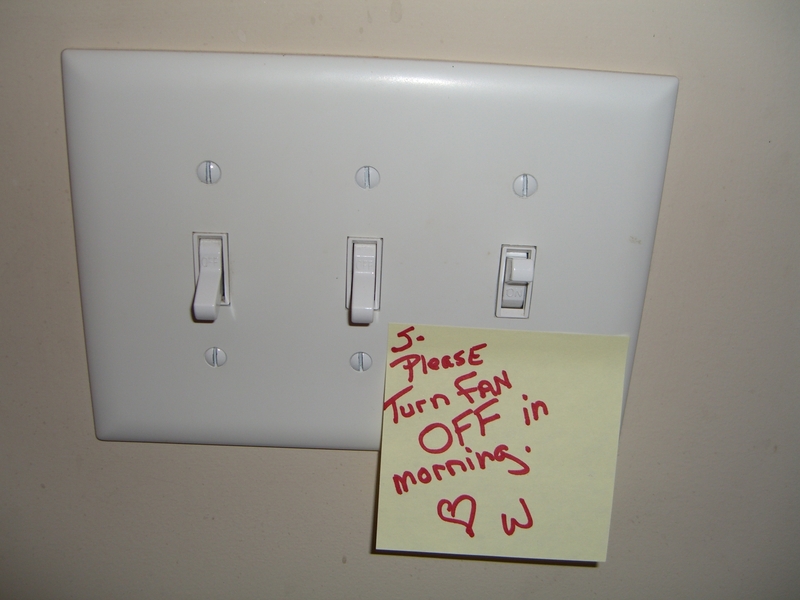 My hubby needs noise to sleep, so he leaves the bathroom fan on at night. This doesn't bother me because I take my hearing aid out. However, in the morning the first sound I want to hear when I put my hearing aid in is not a wind tunnel!!!! Since my hearing is distorted, the fan doesn't just sound like a little fan, it sounds like I'm in a huge wind storm. So honey, please remember to turn the fan off. The 2 notes are on our front door, things we don't want to forger when going outside. 1 - I have an emergency kit made up in case I have an attack when I am out. This item we should never leave home without. Also I need to drink a lot of water with the medication I'm on, and I also need to have water close in case I have to take emergency pills. A Must that we Cannot Forget when leaving the house! 2 - I'm often spent by the evening, so Hubby needs to water the plant in the front. We have a small area with herbs, and some flowers. He often forgets to water. This has made for an unhappy wife. So Watering the Plants out front...Important not to forget! 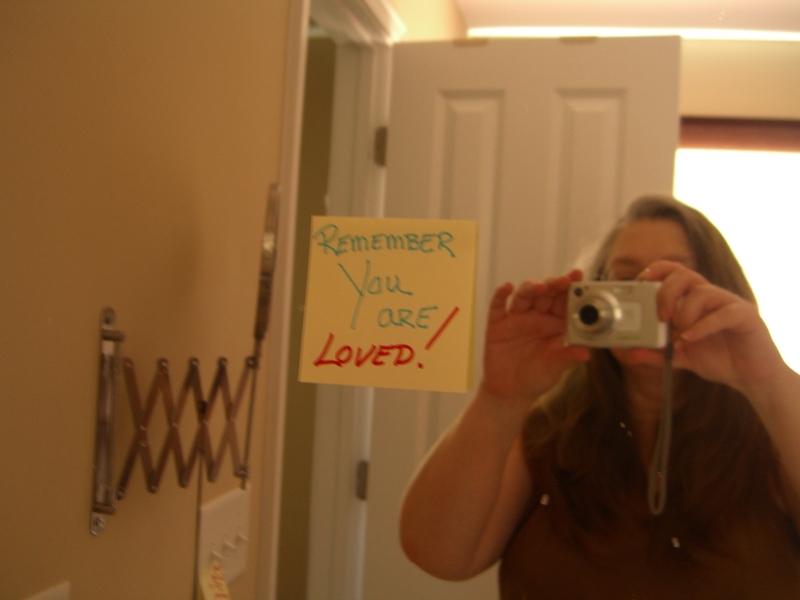 Very Important, Every Day, a note to myself "Remember You are Loved!" Your last note in the series, “remember you are loved” is wonderful! Would make a great fridge magnet too. (Collecting fridge magnets/sayings from fridge magnets is a whole other blog post). I don’t know how I managed (probably didn’t — can’t remeber, lol) before the advent of post-it-notes in neon bright colors, lined, super-sticky and with different sizes and shapes! There is a mosaic (spelling), or tapestry of them posted all around the house. Also helps to cover up the walls, furniture, cabinetry that could use some refreshing or fixing. I would be like Edie, if I left them up all the time, I’d become immune, and stop reading them. We never forget my emergency kit now….I have a bigger purse and everything is in it. Most of the post-it’s are things I must remember yes, but i don’t really have the notes. haahaha I have my medicine where I can see it better. 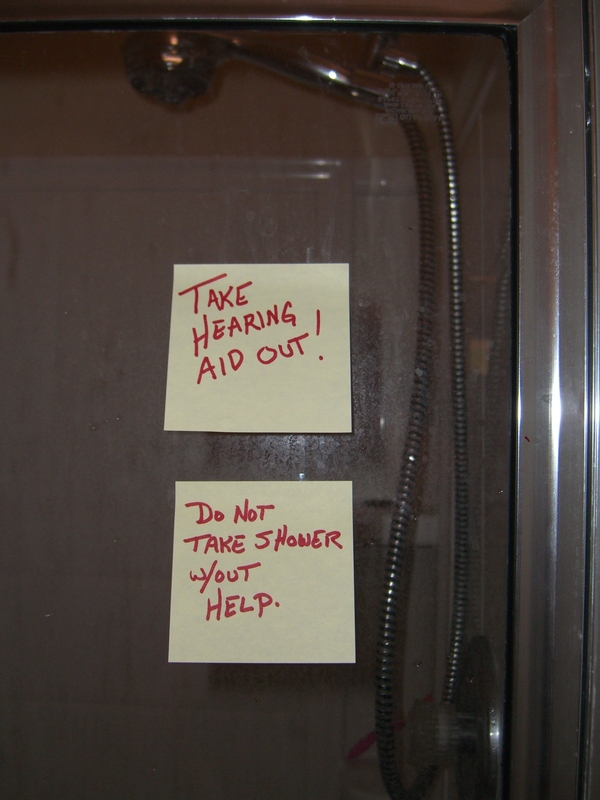 I always have to have help in the shower, so I don’t forget my hearing aids. I have ear plugs right by the shower, so I know to take out my hearing aids to put the plugs in! And Stuart helps me a lot. He is my own personal Post-It.